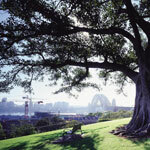 Sydney has a mulitude of beautiful park areas for taking wedding photos. Flowers, trees, fountains, and green spaces can make your wedding photos very natural and vibrant. Our fore fathers planned well for green space around and in the city, so places like Centennial Park, the Domain, and Hyde Park to name just a few. 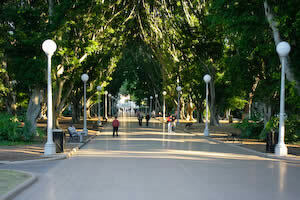 Hyde Park is a favoured spot for wedding photos and deservedly so. The main fountain is a unqiue feature and looks wonderful at night. You get some great shots if you can use the long avenue with the trees making a lovely frame - just try and avoid the crowds! Close to Martin Place for another great wedding photo location. Neilsen Park is a popular place for relaxing and getting back to nature, so if you can beat the crowds it makes a fantastic wedding photo location. The long avenue from the main gate (see opposite photo) has interesting lines, the beach is small but can be used when crowds are low, and there are a couple of out crops to take some shots looking over Sydney Harbour. 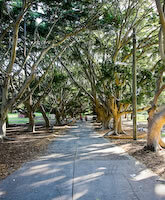 McKell Park is small and private park tucked away at the end of Darling Point road between Rushcutters and Double Bay. It has a quiet aspect but a wonderful position right on the Harbour, and access is easy for boats or yatchs to wisk you away following a ceremony. 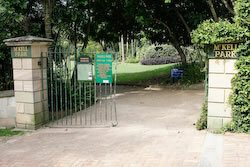 Most people have their wedding ceremony down the end of the park near a circular area. 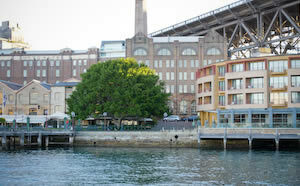 Not a huge range of photo locations within the park itself, but hop on a boat or water taxi and you have the whole of Sydney Harbour to choose from. Check with local council to book and gain wedding permission. The outlook from Observatory Hill is wonderful, but there are plenty of other shots to be had in this area of the Rocks. The stone and trees of the park can be used for some great wedding photos, and there are often a few less people around. Federal Park is a stones throw from Sydney CBD and can be a good photo location to do a breif stop over on the way to the city or Rocks area. 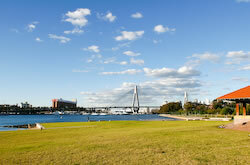 The city skyline is impressive and the tall towers of the Anzac Bridge makes for a great photo back drop.